Midwest Roadwise Committee – Midwest residents, do you want to get involved in local road safety initiatives? 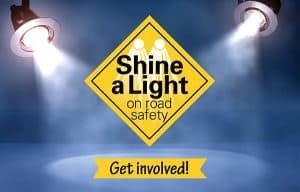 The Midwest Roadwise Committee are looking for members to join them in delivering road safety initiatives in the area. If you have an interest in road safety and would like to find out how you can get involved, please come to our Step into Volunteering session on Monday, 15th April where the local Road Safety Advisor, Sam Adams, will be speaking. Midwest Yellow Ribbon- Volunteer Member: Are you looking for ways to give back to the community? Midwest Yellow Ribbon Committee are calling for more Volunteer Members! Volunteers are required to assist committee members with the general running of the organisation. This can be done in many ways – helping with planning, organising and attending several promotional venues throughout the year. Volunteers will need to be able to work with people from different backgrounds that may or may not be suffering from a mental health issue. 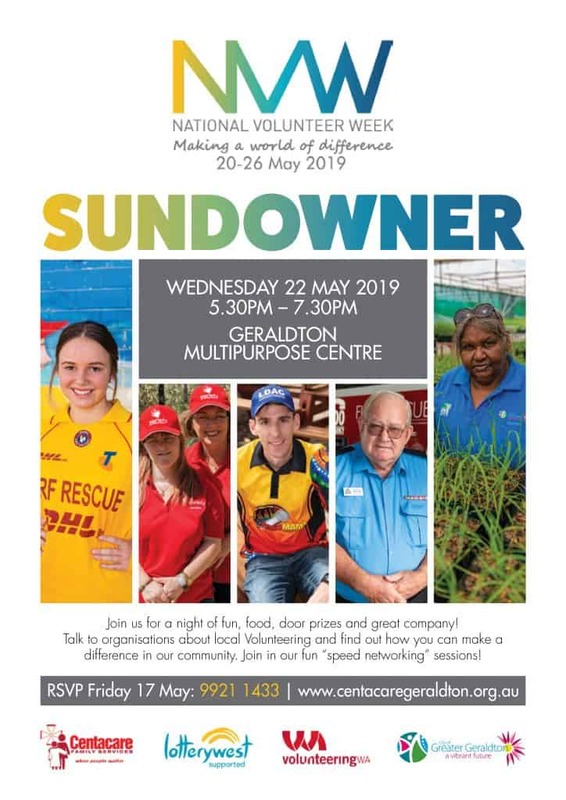 Midwest Yellow Ribbon look forward to welcoming new Volunteers so come along and share your skills and interests today! Communicate WA – Group Facilitator: Communicate WA is a support network in Western Australia for people experiencing communication difficulties after a stroke or acquired brain injury and to raise awareness about aphasia. A volunteer group facilitator is required to be there to help group members chat socially, make new friends, assist in practicing and improve communication, make a cup of tea and have a laugh too. You will be provided with training about the role and will have another volunteer with you. The group meets Monday afternoons at the Geraldton Regional Library! Centacare Family Services – Raffle Ticket Volunteers: Centacare is looking for the generous support of local people to join our team of Raffle Ticket Volunteers for our annual Mother’s Day Raffle! If you can offer an hour or two of your time, we would love to hear from you! Volunteers help sell raffle tickets at various supermarkets. It is a great opportunity to catch up with old friends and people you haven’t seen while supporting our organisation. 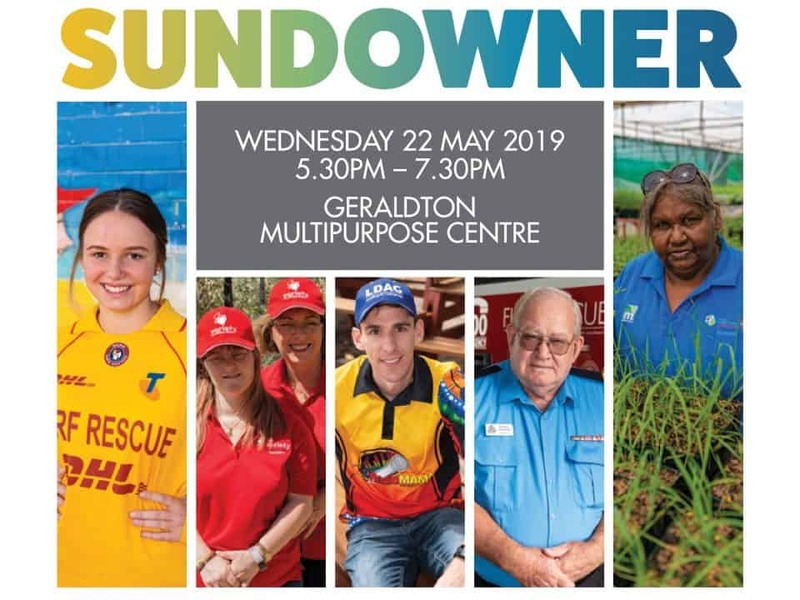 Foodbank Geraldton – All Rounder Volunteer: Have you got some time on your hands and see yourself as a bit of an all-rounder? Foodbank Geraldton is seeking an enthusiastic Volunteer who is able to do a wide range of tasks to assist with the smooth running of the Warehouse. Tasks may vary from week to week which may include-Garden maintenance, sweep floors, operate floor cleaner, clean windows, pickup/ drop-offs around town, wash vehicles and lots of little odd jobs to keep premises neat & tidy! Be part of a great team of Volunteers and staff, who go out of their way to support those in our community! Ngala Midwest and Gascoyne – are looking for a friendly keen gardening enthusiast to spend some time on a casual basis once a week to provide some well overdue love and care to the outdoor nature garden area at the Child and Parent Centre- Rangeway! No mowing is needed just some pruning, weeding and at times some planting of seasonal flowers and veges! No qualifications required just the love of being outdoors and gardening!! WWCC and Police Check is required. Guest speaker from Roadwise Committee Geraldton. 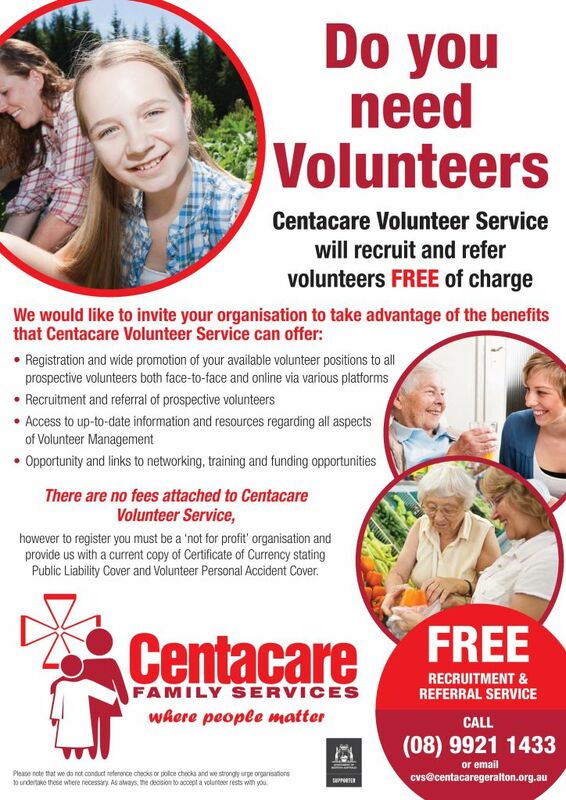 If you are interested in any of the above volunteer positions, or are thinking about volunteering, please call Kristy or Michelle at Centacare’s Community Volunteer Service on 99211 433 or email cvs@centacaregeraldton.org.au for further information. Find us on Facebook and use hashtag #GeraldtonVolunteers when posting online about your volunteer experience!